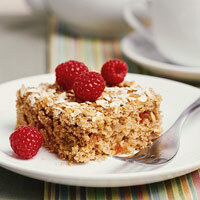 This hearty whole grain cake is perfect for dessert or a snack. The applesauce imparts flavor, moisture, and replaces some of the fat. 1. Preheat oven to 350 degrees F. Lightly coat a 13x9x2-inch baking pan with nonstick cooking spray; set aside. In a medium bowl, stir together all-purpose flour, whole wheat pastry flour, the 2/3 cup oats, the baking powder, cinnamon, baking soda, salt, and nutmeg. Set aside. 2. In a large bowl, combine the 2/3 cup brown sugar and the butter. Beat with an electric mixer on medium speed until well mixed. Beat in egg product and vanilla. Alternately add flour mixture and applesauce to beaten mixture, beating after each addition just until combined. Stir in fruit bits or raisins. 3. Spread batter into prepared pan. In a small bowl, combine the 1/2 cup oats, the wheat germ, and the 2 tablespoons brown sugar. Sprinkle oat mixture over batter; press lightly into batter. Bake for 25 to 30 minutes or until a toothpick inserted near center comes out clean. Cool completely in pan on a wire rack. If desired, top each serving with raspberries. Makes 20 servings.